We’d love your help. Let us know what’s wrong with this preview of Crash Land by Doug Johnstone. To ask other readers questions about Crash Land, please sign up. Finn Sullivan has spent the last few days visiting his grandmother Ingrid on the Orkney Islands. They’re close & it was good to catch up but now all he wants is to get back to uni, finish his course work & figure out what to do about his girlfriend. He’s sitting in Kirkwall Airport when he first sees her. Maddie is a beautiful, older woman who shares Finn’s desire to leave the Orkneys. So when their flight is delayed they pass the time getting to know each other at the bar. Finally the weather clears & everyone clampers aboard. The plane is just a little puddle jumper & passengers & crew total 11 people. Remember that number. I don’t think I’m giving anything away when I say they don’t make it off the island. It’s the beginning of a bizarre chain of violent events that will change Finn’s life forever. He’s a rather unworldly 21 year old & quickly bedazzled by the sophisticated Maddie. But it’s clear early on she’s a woman of many secrets. As the story progresses we, like Finn, aren’t sure what to make of her. At best, Maddie is a woman with good reason to escape her life. At worst, she’s a manipulative liar. It’s a fast paced read that crams a lot of action into 265 pages. Some of the events & Finn’s actions in particular will require that you can suspend your disbelief but hey, this is fiction. What worked best for me was the atmospheric setting provided by descriptions of this beautiful place. The wind, water & creeping fog shape the land & lives of its residents. Many of the ancient Neolithic sites such as the Tomb of the Eagles & Ring of Brodgar are mentioned along with some history of how the islands were settled. I was lucky enough to visit the Orkneys several years ago & it’s a fascinating place. From St. Magnus Cathedral to the countless standing stones, there’s a palpable sense of stepping back in time & I enjoyed the chance to revisit those memories. Doug Johnstone is back with Crash Land and he has delivered yet another classic thriller that will keep you on edge throughout and constantly questioning what you know. This brilliant thriller takes place with the background of winter out on the Orkney Island, with its harsh backdrop and the full force of winter. Finn Sullivan wants to get off Orkney and it cannot happen quick enough, he wants to be back in Dundee for Christmas and away from the harsh island. He is sat in the departures lounge at Kirkwall Airport when he spotted a beautiful woman coming through security and the oil workers also notice her as she comes through to departures. The fog is down over the airport and when the plane is delayed Finn carries on drinking and while at the bar meets Maddie Pierce, while rescuing her from the unwanted attention and hassle from the oil workers. One drink leads to a quite a few more and while chatting to Maddie he learns she is running from something but cannot find out more about her. When the plane takes off with them on board, Finn goes to the toilet and when he comes back he finds Maddie being hassles by one of the workers again. A fight ensures and Finn is restrained and the plane turns around and heads for back to the airport and the rest seems a blur, he remembers the plane hitting the ground, the smell of aviation fuel and fire. When he wakes up he is in hospital, he is being blamed for the crash, seven are dead and Maddie is missing and the police are asking him questions. But as the days pass the more he is drawn in to a dangerous game of cat and mouse with the police, the media and with his own mind. What he discovers is a dangerous world that has drawn him in and that will affect not just him but those close to him also. All Finn wants to do is tell the truth, but will he believes and will it be too little too late? Crash Land is a classic thriller from Doug Johnstone that keeps you guessing from the beginning to the end. Well written, and with the harsh backdrop of Orkney you can feel the pressure and the loneliness unforgiving island. At the sametime it has all the classics of a psychological thriller, guilt, shame, lust, deception and murder, just what the reader wants. Bloody hell that Doug Johnstone knows how to hook a reader! Crash Land starts of with a bang and the pace is absolutely relentless. I devoured this book in less than 24 hours, reading at every available opportunity to see what the hell was going on! Starting off innocuously enough, the reader meets Finn waiting at the airport for his flight home. Seeing Maddie in the lounge getting hassle, he goes to try and help her out. This moment will change the course of their lives forever. I’ve read a coupl Bloody hell that Doug Johnstone knows how to hook a reader! Crash Land starts of with a bang and the pace is absolutely relentless. I devoured this book in less than 24 hours, reading at every available opportunity to see what the hell was going on! I’ve read a couple of books based in Orkney lately, so I’m relatively familiar with the landscape thanks to the various descriptions and locations used. I actually had an idea where the author was talking about at times! Orkney is a harsh and unforgiving landscape, and this only serves to make it all the more atmospheric. Crash Land is gripping from the outset. Full of action, secrets and lies. And listen, we all know that these can come back to bite you in the behind and it’s no different here. It’s an exceptionally fast paced read, with plenty of different avenues for the reader to get lost in which I love. That’s what keeps me reading. Put me off the scent and I’ll keep reading until I damn well figure it out!!!! I thoroughly enjoyed this book. I got lost in the pages, and when I wasn’t reading it I was thinking about how soon until I could get back into it. This was my first book from Doug Johnstone but it certainly won’t be my last. Even though I have enjoyed all this authors novels, Hit and Run has always been my personal favourite. Well, that is until today. After reading Crash Land, it is without a doubt now my firm favourite, very closely followed by Hit and Run. Crash Land is a very atmospheric read. Set in Orkney you get a real feel for how isolated a lot of the area is. No doubt it is a beautiful place but due to the story line it left me feeling quite chilled to the bone. The weather can be relentless at times and so Even though I have enjoyed all this authors novels, Hit and Run has always been my personal favourite. Well, that is until today. After reading Crash Land, it is without a doubt now my firm favourite, very closely followed by Hit and Run. Crash Land is a very atmospheric read. Set in Orkney you get a real feel for how isolated a lot of the area is. No doubt it is a beautiful place but due to the story line it left me feeling quite chilled to the bone. The weather can be relentless at times and some parts of the story made me want to snuggle underneath a warm duvet with a nice hot drink. Finn is just your average Joe. He is slowly strolling through life and letting it just take him where ever it goes. Meeting Maddie seems to awaken him and it is like he has become a different person. Where as before he was a law abiding citizen, Maddie makes him more reckless. It is obvious that he is infatuated with her and is more than happy to throw caution to the wind by helping her hide from the police. From getting on the plane, Finn’s world seems to spiral out of control. Being involved in a plane crash that leaves several people dead certainly doesn’t seem to knock any sense into him. Maddie just seems to have a cast a spell on him that he can’t break. In a way he does come across as being quite weak as he fully lets her manipulate him, but overall I still found him a likeable character. Maddie is a very complex character. I really wanted to believe her innocence in everything that was happening but there was just something about her that I didn’t know if I could fully trust. She certainly manages to not only captivate Finn, but the reader also. Crash Land is an absolute cracker of a read. It is full of suspense and intrigue and I was hooked from start to finish. The author manages to keep you guessing while playing with your mind. With quite a few OMG moments, this is without a doubt a must read for fans of psychological thrillers. I enjoy books where the facts are all laid out and you have to draw your own conclusions about what happened; you aren’t given concrete answers. This is the case in Crash Land. I enjoyed that aspect of the story. However, this will bother some readers. This author is very descriptive. There were times when I appreciated these details such as the plane crash and the action scenes, but there were others, like the island descriptions when it was too much and caused me to skim. The one thing I couldn’t overlook in this story was their cell phone use. They are investigating a missing person for their role in a plane crash and murder and don’t check their cell phone records? Unbelievable! Excellent writing as I've come to expect from Johnstone. Orkney comes alive in this tense thriller. University student Finn Sullivan has been visiting his grandmother on Orkney but is now about to return to Dundee, where he lives with his girlfriend. Whilst waiting at the airport on the island for a flight back to the mainland, he is attracted by fellow traveller Maddie Pierce, an attractive woman more than ten years his senior. When she is clearly upset by some unwanted attention from a group of oil workers, who are also waiting for the flight out, he takes the opportunity to make contact with her. When their flight is delayed for two hours due to fog, the pair sit at the bar drinking several double gins and tonics so, by the time they eventually board the flight both are feeling the effects of the alcohol. Once they are airborne, and whilst Finn is away from his seat, one of the oil workers sits next to Maddie and starts to hassle her again. When Finn returns a fight ensues and both men are eventually restrained; the pilot makes the decision to return to the island to hand them over to the police. Then, in worsening weather the plane crashes; several people die but Finn survives with very painful but minor injuries, two broken fingers and a cracked rib. However, in spite of an extensive search, there is no sign of Maddie; she appears to have disappeared into the night. The story then concentrates on Finn’s strenuous efforts to find her and to protect her from the police, who are keen to track her down and question her in relation to a murder enquiry. It is a long time since I have ploughed through a story which I have found as unconvincing in its plotting and characterisation as Crash Land. With the exception of Ingrid, Finn’s grandmother, none of the characters felt either engaging or credible to me. They were constantly behaving in ways, as they lurched from one foolish action to another, which made me alternate between wanting to shout at them not to be so stupid, or to shaking my head in disbelief at their fecklessness. I found no psychological credibility in any of them, or in any of their actions, so at no time did I ever feel able to either take them seriously or, from very early on, to care what happened to them. As for the plotting, that had me, Victor Meldrew-like, thinking “I just don’t believe it!” over and over again. Not only did it feel that some of the high-octane action scenes were bordering on the ludicrous, but given Finn’s injuries, his state of intoxication and the effects of morphine-based pain relief, he would have been unable to carry them out! Throughout the story I felt that I constantly had to suspend disbelief – a state of mind I am quite happy to escape into in a fantasy novel, but not in a so-called thriller! I always enjoy stories which evoke a vivid sense of time and place and had hoped that this one would give me a similar feel for Orkney that Peter May, for instance, conveys in his series of books set on Lewis. However, Doug Johnstone’s descriptions of Orkney, although numerous and extremely detailed, felt rather too reminiscent of a rather dry, factual travel guide. The descriptions didn’t enhance the story for me, maybe because I didn’t feel able to place his characters within the landscape. That said there were times when, as a “character”, the island had rather more going for it than any of the humans did! This book is described as “an adrenaline-charged thriller” but for me it was just an exasperating and rather tedious read; had I not been reading it for a review, I would almost certainly have given up on it about a quarter of the way through. I had never read any of this author’s books before and, in view of his popularity, I wonder whether this story is a departure from his usual style – although, after this experience, I have to say I am not inclined to try to find out! Really the only positive comment I can make about the book is that it was a very easy (apart from feelings of increasing frustration!) and quick read, so I wasn’t left feeling too resentful that I had wasted my cherished reading time! This is not a book which I would recommend for reading groups – although I can imagine that any group faced with reading it would find lots of scope for discussion – about all that didn’t work in the story-telling!! Following hot on the heels of last year’s The Jump, I had high expectations for Crash Land. Doug Johnstone knows how to write a cracking thriller. Crash Land was masses of dark fun and incredibly engaging. I was shaking my head at the stupidity of Finn for most of the time. The story itself takes us to remote Scotland. Finn lives on the Scottish mainland, with his girlfriend. He is coming back to Orkney, when he encounters an older mysterious woman. This sets off a tragic chain of events. Finn sp Following hot on the heels of last year’s The Jump, I had high expectations for Crash Land. Doug Johnstone knows how to write a cracking thriller. Crash Land was masses of dark fun and incredibly engaging. I was shaking my head at the stupidity of Finn for most of the time. The story itself takes us to remote Scotland. Finn lives on the Scottish mainland, with his girlfriend. He is coming back to Orkney, when he encounters an older mysterious woman. This sets off a tragic chain of events. Finn spends time with Maddie at the airport bar and falls under her spell. On the plane, Finn plays the hero rescuing Maddie from unwanted male attention. The plane crashes unexpectedly killing most of the passengers. Finn has to deal with the aftermath of this, both on a personal level and psychologically. What he really should be asking is whether he should trust Maddie? Poor Finn. He really is the most naive man on the planet. He blindly trusts someone he has just met. His whole life spirals out of control. He loses his sense of morality, as he adjusts to the chaos of his life. My heart went out to him. It was easy to like Finn and to understand his foolishness. I spent most of the book willing him to be a bit more on the ball. I could see what was going to happen next. Maddie spelt danger to me, from the outset. I'm doing a blog tour for this nearer publication - my review will appear November 2nd, so I'll be sure to copy my thoughts onto here. But my star rating will give you an indication of my thoughts! Oddly, it's the first Doug Johnstone I've read, although I was reading The Jump en route to Bloody Scotland, as it was in the last 4 up for the McIlvanney Prize - it didn't win; that honour went to Chris Brookmyre's exceptional Black Widow. Anyway, as ever, I digress - but I really must finish it! Read this on the train yesterday. Really thought it was great, great story, divisive characters, poignant setting. Full review nearer publication. Crash Land is a compulsive thriller. It is packed full of action and intrigue, with an unlikely super hero lead character and the wonderfully depicted Orkney island. It's far from my usual sort of read, but I was absolutely gripped by the writing, and the plot and the tension that the author so brilliantly creates. back to visit his Gran and is waiting for a flight home. At the airport he rushes to the aid of an older woman, Maddie, who has caught the attention of a group of oil workers who are leaving the island for their Christmas break. The flight is delayed and Maddie and Finn spend a few hours at the bar. There is a mutual attraction, despite the age difference. When they finally board the plane, Finn and Maddie sit together and continue to get to know each other until once again, one of the oil workers tries his luck with Maddie. Finn's intervenes and here's where the story really beings to get explosive. Anyone who sees the front cover of this book, and the title will realise that the flight is not going to go smoothly, and Doug Johnstone's description of what happens next is terrifying. If, like me, you have to start each flight with a couple of valium and a few Hail Marys, then you will be absolutely freaked out by his incredibly realistic writing. It left me feeling very shaky, and just a little sick .... but, it's so so good. The rest of the book concerns the aftermath of the big event and it's a plot that twists and turns at every page. Finn has found himself at the centre of something that he can't control, he doesn't know who to trust. He feels guilt and anger, and some frustration. He makes decisions that are questionable, but he is determined to get to the bottom of the mystery, despite threats from both the authorities and the shadowy underworld figures that emerge. This is a fabulous story, full of action and plot twists that keep the reader totally gripped. With characters you will either love or hate and a small community setting that really adds to the flavour of the story. A really excellent read, I was very impressed. I'm a big fan of Doug Johnstone's books and heard him mention this book briefly last year at the book launch for his previous novel The Jump. I am not a fan of flying, however, and this book did little to dispel my fears! It begins with Finn Sullivan meeting and having a few drinks with stranger Maddie Pierce at Kirkwall airport after their flight is delayed due to bad weather. Once in the air, in the tiny plane, Finn becomes involved in a fight with an oil worker who is harrassing Maddie - a bi I'm a big fan of Doug Johnstone's books and heard him mention this book briefly last year at the book launch for his previous novel The Jump. I am not a fan of flying, however, and this book did little to dispel my fears! It begins with Finn Sullivan meeting and having a few drinks with stranger Maddie Pierce at Kirkwall airport after their flight is delayed due to bad weather. Once in the air, in the tiny plane, Finn becomes involved in a fight with an oil worker who is harrassing Maddie - a bit of a nightmare scenario for me! I don't think, given the title and cover of the book, that's it's giving much away to say that the plane then crashes. This is book which will make you think about the consequences of your actions. Although not directly responsible for the plane crash, Finn's decision to defend Maddie leads to the crash and to him making a whole lot of other bad decisions. At least I felt they were bad. One lie just seemed to lead to another and I was wondering what on earth he was thinking! It is also a book about who you can or should trust. Although he didn't really know her at all, Finn felt he could trust her rather than people he had known for years. Because of his decisions, he put himself in such danger. Doug Johnstone has created the perfect ratio of tension, drama, excitement and danger throughout the book. With all the action taking place against the beautiful though rugged Orcadian landscape, I felt this was a book which would lend itself well to a film version. I particularly liked how the ending was a bit ambiguous, leaving me wondering just what had happened to Maddie - and what decision Finn would make next! 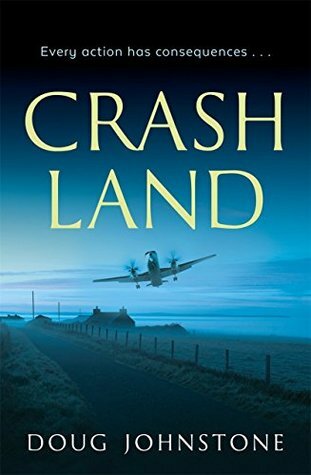 A taut thriller, Crash Land is another excellent read from Doug Johnstone. again im giving a higher rating to a Doug Johnstone book that it deserves. again the main plot is mince. again in the last 10% of the book the baddie is chosen and theres a struggle and the good guy comes out okay. but.... what Johnstone always gets right, gets 5 star, is the descriptions, the characters, the back story. in this, the majority of the book is great, the whole start at the airport, the crash, the characters, excellent. like his other books, he takes a bad story and fills it out wond again im giving a higher rating to a Doug Johnstone book that it deserves. again the main plot is mince. again in the last 10% of the book the baddie is chosen and theres a struggle and the good guy comes out okay. but.... what Johnstone always gets right, gets 5 star, is the descriptions, the characters, the back story. in this, the majority of the book is great, the whole start at the airport, the crash, the characters, excellent. like his other books, he takes a bad story and fills it out wonderfully. This was an ok book to read whilst on holiday but it didn’t have much substance to it. Weak characters who never really developed. I just got annoyed by Finn, who would do what he did after just meeting a woman, never mind how enticing she was? Although I did enjoy the descriptions of Orkney and I did dream about a plane crash last night, so maybe the book got to me more than I thought! Oh dear. There's a plane crash, and while the circumstances leading up to it were a bit of a stretch, so was everything else. It wasn't so bad that I failed to finish but I was happy when it was all over. Couldn't care less about any of the characters - wished they'd all died! This is another favorite by Doug Johnstone. When Maddie single handedly brings down a plane, Finn is intoxicated by her and makes bad decisions about hiding her until he can't anymore. She is mysterious but dangerous, part of the alure for the young Finn. This is a great mystery and a must read! It did appeal to me right from start as Orkney is one of my favourite places in Scotland and the setting was very atmospheric. I didn't quite warm to Finn and wanted to slap him a few times but I guess he was a young man finding himself in a very bizarre situation. enjoyed reading it but didn't love the ending. This review has been hidden because it contains spoilers. To view it, click here. Good, quick read. Not sure that all questions were answered (Maddie's background) and not sure why, if there was a full (wo)man hunt going on, the Tomb of Eagles isn't searched. Enjoyable page-turner set in Orkney (which has made me want to drag myself up there to visit the islands), which is pleasingly unpredictable throughout. The best Doug Johnstone book imo. This review has been hidden because it contains spoilers. To view it, click here. A bit unsatisfied because of the end. I love Doug Johnstone’s books. They do not end happily ever after. He recognises that life is messy, that people make mistakes and that there are consequences. And there is no question that Finn makes a mistake. It is not so much that he lets an older woman chat him up at Orkney Airport, when it is obvious that she is only doing it to get away from an oil worker who is sexually harassing her. It is the fact that he gets involved in a fight with the oil worker on a plane when all he had I love Doug Johnstone’s books. They do not end happily ever after. He recognises that life is messy, that people make mistakes and that there are consequences. And there is no question that Finn makes a mistake. It is not so much that he lets an older woman chat him up at Orkney Airport, when it is obvious that she is only doing it to get away from an oil worker who is sexually harassing her. It is the fact that he gets involved in a fight with the oil worker on a plane when all he had to do was call one of the stewards for help. This fight leads to the crash landing of the title and, this being a Doug Johnstone novel, mayhem follows. Doug Johnstone obviously thinks that the Scottish Islands are places of dark passion and extreme violence. If you don’t believe me, read Smokeheads. There are enough bodies in Crash Land to make the Midsomer Murders look restrained. This book, however, is much more interesting than that because Doug Johnstone does not shy away from the ethical issues. To my mind, ethical issues lie at the heart of Johnstone’s writing, and his main characters do not always make the right choices. And Finn, as I have already said, does not necessarily make the right choices. He certainly does not make the sensible ones. I cannot explain this conclusion because that would involve giving away the plot of the book. So what can I tell you about? I will start with the style. Johnstone is a master storyteller. He knows how to spin a yarn. He leads the reader on from cliffhanger to cliffhanger. Have no doubt about that. You will really want to know what happens next, and what will happen to Finn and Maddie. You may think that Finn is insane to get himself involved with Maddie, but you will certainly understand why he does. She is the classic femme fatale, prepared to use a young man for her own convenience, but you will wonder if she actually falls for Finn. If you think of D’Artagnan and Milady de Winter, you will get the idea. Or of Ava Gardner’s character in Showboat singing “Can’t help loving that man of mine”. Maddie is that kind of dangerous woman.